Herschel Goldhirsch was born in a small a village in eastern Galicia, then part of the Austria-Hungary Empire. His father and older brother travelled to Canada and the USA and eventually brought the rest of the family to New York City in 1905. Immigration officials at Ellis Island changed the family surname to Goldhurst. He grew up on the Lower East Side, attended public school and City College of New York. After graduation, he worked at numerous jobs, including in the fur business and as a stockbroker. He went to jail from 1929-1932 for stock fraud. As the Nazi menace in Europe grew in the 1930s, he acquired a deep interest and appreciation for Jewish history and culture. In 1941, he left New York and moved to Charlotte, North Carolina, where he changed his name to Harry Golden. He joined the staff of the Charlotte Labor Journal and the Charlotte Observer before starting his own newspaper, The Carolina Israelite, in October 1942. Golden wrote all of it and issued it whenever he was ready. It became an influential publication in the South and in major cities such as New York, Chicago, Los Angeles, and Philadelphia. The Carolina Israelite was a forum for Harry Golden's liberal social and political views, most controversially civil rights and union labor. Harry Golden collected some of his Carolina Israelite essays and published them as a book, Only in America, in 1958. It became a success seller and made him a nationally known writer and humorist. He was a frequent guest on national television programs and a contributor to journals such as The Nation, Commentary, and Life Magazine, and a popular lecturer around the country. He published a bestselling biography of his friend Carl Sandburg in 1961. 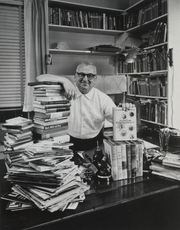 Harry Golden is currently considered a "single author." If one or more works are by a distinct, homonymous authors, go ahead and split the author. Harry Golden is composed of 5 names. You can examine and separate out names.